Now that the Cold War is over, microwave toilet research has been fully declassified. Just kidding, this crap(per) was always meant to be a commercial product! 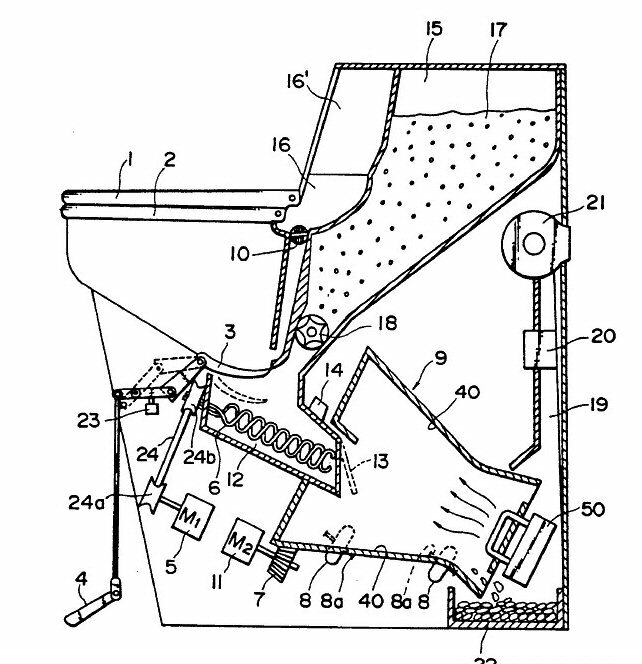 There are several patent examples of using microwave energy to incinerate waste, this one is US Patent 5,276,924, Method and Apparatus for Disposing of Body Wastes. In many places there is no access to water for sanitation, and there is a real need for toilets that can render "substances" safe. Beyond the outhouse and latrine technologies (thanks to the French language for providing soldiers a name for an important hole in the ground), there have been commercially-successful non-water systems in two categories: composting, and electrical incineration of wastes. Electrical toilets, affectionately known as turd-burners, have at least a psychological advantage, as the waste is cooked enough to kill any organisms in it. Here, microwave technology seems to be misplaced. Sure, you can cook stuff quickly with microwaves, but a lot depends on the dielectric properties of the material. In the referenced patent, you have to drop in some absorbing material (find 17 in the sketch) to dry the waste (think "cat litter"). The patent mentions that the absorbing material can be collected and reused. We'd hate to have to argue over who's chore that's going to be. This might sound sacrilegious, but we're inclined to think that a simple resistive heating element (like a toaster) could be a better idea than trying to use microwave energy in this application. You would never have to fear any RF energy accidentally inpinging on your reproductive equipment.